Lionel Scaloni said Lionel Messi's absence has forced Argentina to play as a team, though he hopes the five-time Ballon d'Or winner will return to the international fold. Messi was once again absent as Argentina eased past Iraq 4-0 on Thursday in the first game of a four-team tournament that also features Brazil and Saudi Arabia. The Barcelona superstar's future with Argentina is uncertain, having not been included in either of the country's two squads following their last-16 exit at the World Cup. With Messi's future up in the air, interim head coach Scaloni said Argentina must adopt a different approach. "I hope Messi is in the future, he is the best player in the world," Scaloni said during his post-match news conference. "If he is not, we should try to play as a team, that is the idea, that we play as a team and we are difficult to beat." 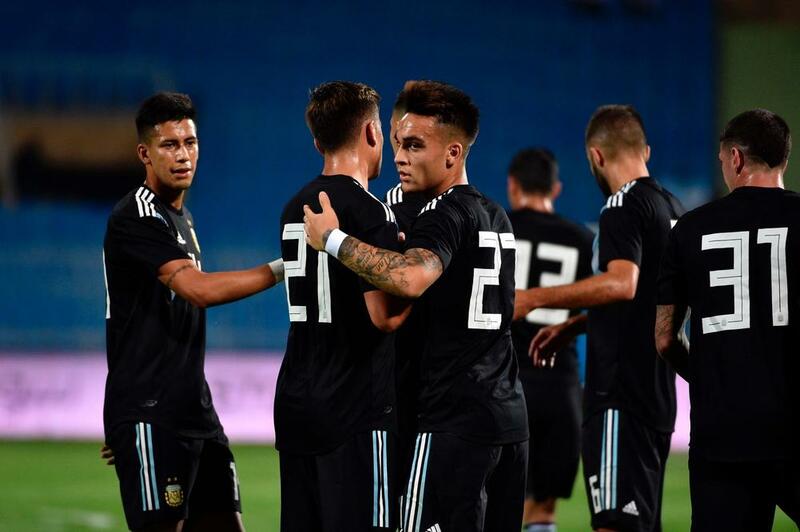 Lautaro Martinez scored his first goal for Argentina on his full debut, while Roberto Pereyra, German Pezzella and Franco Cervi were also on target. It was an experimental side without the likes of Messi, Sergio Aguero and Gonzalo Higuain at Prince Faisal bin Fahd Stadium in Riyadh. Reflecting on the match, Scaloni – who bemoaned the state of the pitch – said: "It was a complicated game because of all the connotations. I saw the team quite tired. There was a lot of travel and a single training." Former international Scaloni is in the hot seat on a caretaker basis following the departure of Jorge Sampaoli after Russia 2018 and the 40-year-old is not sure what his future holds. "I am [in charge] now until November and then I am not," Scaloni added. "I hope these players can continue playing in the national team. I hope whoever comes, if he wants, can add these men with the other great players. The idea is that many of these guys, why not all, continue in the national team." Next up for Argentina is a mouth-watering showdown with South American rivals Brazil on Tuesday.